Please donate whatever you can – every penny makes a difference. Thank you for anything you can give. Somerset West Lottery supports many charities in the local area. 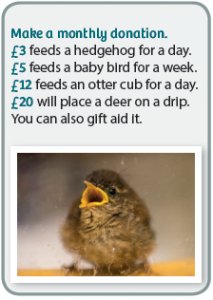 As one of the good causes, you can buy a lottery ticket and be in with a chance of winning big at the same time as supporting wildlife. 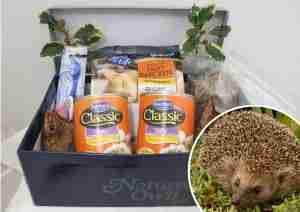 Visit www.somersetwestlottery.co.uk/support/secret-world-wildlife-rescue and get your ticket today. Adoptions make great gifts for birthdays, anniversaries, christenings, wedding presents, retirement and leaving presents and for Christmas. 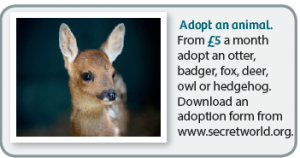 By adopting an animal you are supporting wildlife throughout the year and beyond, particularly if you sign up via a direct debit payment. Download an Adoption Form today or visit the Adoption page for more information. 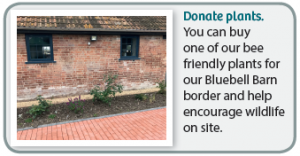 Monthly or regular donations help to rescue and care for wildlife throughout the year, from the cold winter months where animals struggle to find sufficient food, to spring when we have an influx of orphans to rear, through to summer and autumn when wildlife face the challenge of injury through garden maintenance activity and discarded litter, road traffic accidents and nest disturbance. Choose your monthly donation today.